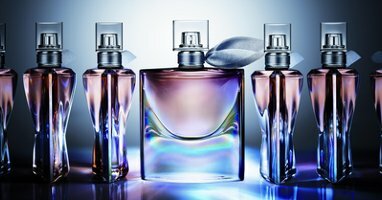 From Lancôme, a limited edition of La Vie Est Belle with "a luminescent finishing to enhance the already beautiful crystal smile bottle". 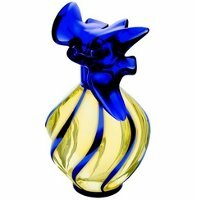 In 50 ml Eau de Parfum, at Sears in Canada, $95. 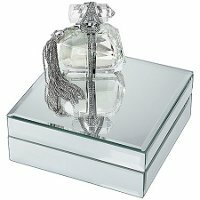 From Marchesa, the "limited-edition Awards Season Couture Edition" of Parfum d'Extase: "Adorned with a dazzling crystalized chain tassel and encased in a mirrored box, this couture edition was designed for every girl's MARCHESA moment. With only 150 made, each one has been individually numbered for authenticity. Now you can experience the red carpet magic of MARCHESA." $98 at Sephora. Oh I don’t like the Ricci bottle at all! What was delicate and pretty in the original is tacky and almost gaudy in bright blue. Ick. Glad to hear someone else doesn’t like it…I love that shade of blue, but it’s all wrong with the delicate lines of the bottle. My first thought was that it was a representation of Snow White’s dress. I was appalled to read that it was L’Air. Agree. There isn’t really a single one here that I want. Eek, sorry about that atrocious spelling! They made this bottle because Lancôme is part of L’Oréal and it worked for Armani Acqua Di Goia with Essenza. Same umbrella, thus try to trend the same ideas. I actually like the Ricci bottle! But I’m a weirdo. Sadly, I DON’T like what L’air du Temps has become over the years, so cute bottle or no, I won’t be buying it. It used to be such a gorgeous fragrance. Oh, glad someone loves it! But true about L’Air du Temps. No you’re not, I love that bottle. But even the original L’air du Temps was not wearable for me, and I couldn’t even really smell the reformulated one, it was like I put it on…but I missed the entire perfume. I could smell it, but it was just kind of er…not present. The Lancome bottle still looks like a mouth guard for a particularly nasty case of bruxism . Isn’t that just a bit too precious?! I like all the bottles(except JPG, I don’t do Madonna bottles they put out, lol) but don’t care for any of the scents. But ya know, after someone said, Snow White’s dress, it kinda makes me not like the Nina anymore! Kinda true! Maybe if they did the bottle a solid blue like the birds on top, keeping the lines/texture but the bottle still being an all solid blue and kept the white frosted doves? I would buy that, totally! Robin, the La Vie Est Belle limited is also available everywhere else. They’ve had it at The Hudson’s Bay Company for about a month already. Just want to clear up its not an exclusive to Sears. Thanks — but really do not ever mean to imply that anything is exclusive to a particular store unless it says so! I just generally link to the store where I got the information. is it just me or is La Vie not exactly selling like hotcakes? I honestly don’t know. I don’t see many mentions, but that doesn’t mean much. If I had to guess, I’d say you’re right, that it’s not selling as they hoped, esp. given the $ they must have spent on JR.